MXXX is the ultimate effect. It is a modular beast containing all our effects in a simple interface with an automatic routing matrix, super-versatile modulators and much more. 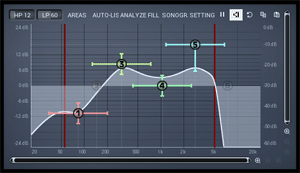 It lets you do everything from simple equalization and compression to the wildest and most creative processing. Too expensive? Check MXXXCore, which is cheaper and lets you buy only those processors you want. Offers 500+ active presets, each is basically a plugin! MXXX comes with more than 500 active presets, designed by the user community, post-processed by us. These are no classic presets. Each of them is essentially a plugin itself! 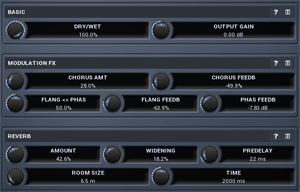 Each of the active presets has its own set of processors and contains several controls you can use to tune the sound. Just like any plugin... Except, well, these are often way more advanced than the plugins you are currently using. Use the keyword filters in the Browser to select the suitable presets, load one and you're all set. With MXXX you can optimize workflow anyhow you like, design your own active presets to get your desired "few knobs", but whenever you need, you can always get under the hood and tweak whatever you like! Modern user interfaces must not only be easy and quick to use, but also versatile and the whole visual appearance should inspire you. MXXX features the most advanced GUI engine on the market. 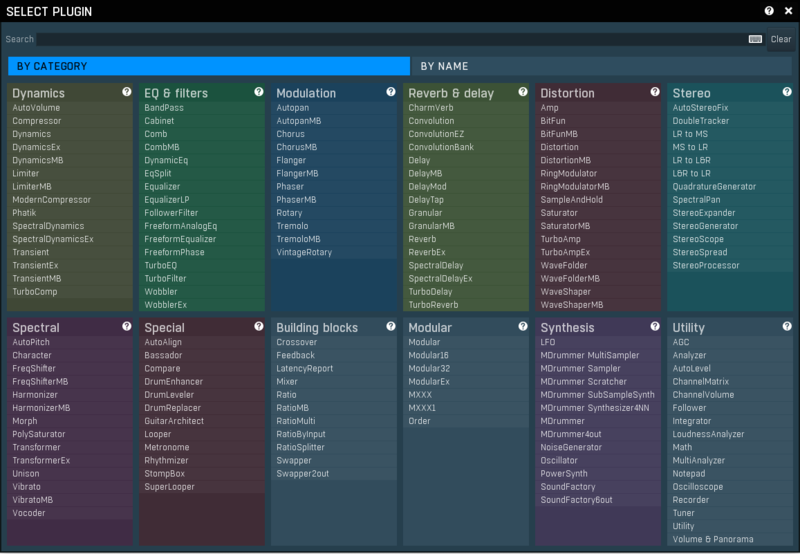 It is still the first and only GUI engine, which is freely resizable and stylable. It also lets you choose between knobs, sliders or buttons, whichever you like the most. Your ears should always be the main judge, but a smart metering system can often be a huge help. MXXX provides the most advanced metering system out there. The plugin can display the measurements of all relevant values using classic meters, or it can even show them in time using the time graphs. Everything is customisable as usual. MXXX provides 3 perfectly transparent crossover algorithms (analog with slopes from 12dB/oct to 120dB/oct, linear-phase and hybrid) with fully adjustable limits, input gains and input panoramas. The audio quality of all of these algorithms is the maximum money can buy. The plugin provides metering for each of the bands and the master. MXXX provides 16 fully-featured modulators which can control any set of parameters including other modulators. Each modulator works as an LFO, level follower, midi/audio triggered ADSR enveloper, randomizer or pitch detector, or even a combination and can listen to the plugin\'s side-chain. Every oscillator in MXXX uses the most versatile oscillator algorithm on the market. 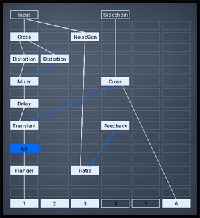 It provides mix of predefined oscillator shapes, custom waveforms edited using our MeldaProduction Envelope System (MES), a step-sequencer and several methods for algorithmic postprocessing. MXXX lets you control multiple parameters using a single so-called multiparameter. This may not only come handy for automation for example, but the multiparameters are very smart units and you can use them to smartly morph between banks of settings for example. All in the name of creativity! Being creative is sometimes complicated and one often needs an inspiration. By clicking a single button you can walk through the billions of possible settings and find the best one for you. The smart randomization algorithm wisely selects good sounding combinations of parameters. It can even randomize modulators for you. And if that\'s too much, you can just hold ctrl and MXXX will just slightly modify existing settings. Most plugins change loudness of the output audio, which makes browsing presets inconvenient, not mentioning randomization. MXXX includes automatic gain compensation, which quickly adapts to current settings and ensures the output sounds as loud as the input. This even protects you from thinking that something sounds better in cases it is just louder. 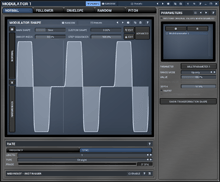 Some plugins can intensely increase gain when exposed to specific audio materials. MXXX provides a safety brickwall limiter, which ensures the output stays below 0dB and prevents your equipment and your ears from potential danger automatically. MXXX implements the most advanced interpolation technology to provide the best audio quality. Digital audio provides very superior audio quality compared to ancient analog gear, but there are problems too. The main problem is the aliasing, which may be noticeable, when using nonlinear processes such as compression or saturation. MXXX includes both minimum-phase and high-quality linear-phase upsampling algorithms, which avoids the aliasing. MXXX contains a powerful MIDI processor, which listen to MIDI controllers and MIDI keyboard and control any parameters realtime. MXXX provides the maximum audio quality you can get. It uses 64-bit audio processing and can handle any sampling rate. It does not make much sense to go over 192kHz, but if you think it is a good idea, the plugin can do that. Computers are now extremely fast, but the algorithms are more complex and projects bigger, so we still need to use the processing power with care. MXXX uses the fastest algorithms, takes advantage of the newest processor capabilities, lets your GPU hangle the graphics, and shares the resources with other MeldaProduction plugins. The plugin is among the fastest on the market, yet it provides the best possible audio quality. MXXX presets are carefully stored in a system database and you can quickly access them from any project in any host. The plugin can automatically share your presets and download presets of other users from our servers. We are building a community and you can be a part of it! MXXX supports all major hosts on both platforms. Check system requirements for information about compatibility and installation. A serious tool for extreme distortion lovers that lets you do really bad things to your bits!